During our Estonian expedition this summer, Richa Ekka (’13) chose as her Independent Study project focus the Soeginina Beds (lowermost Ludlow, Upper Silurian) of the Paadla Formation exposed in southeastern Saaremaa Island. These carbonate sediments, mostly dolomitized, were deposited in very shallow conditions — so shallow that in some places we have syneresis cracks and halite crystal molds. I expected the fossils to be mostly stromatolites and rare traces. We were pleasantly surprised to also find, though, a bed with numerous valves of the giant ostracod Herrmannina Kegel 1933 (shown above). I should have guessed that the hardy and extraordinarily successful ostracods would have been present. 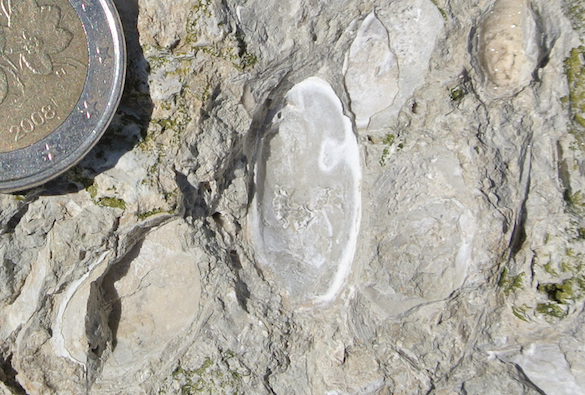 At first we thought that these slightly-recrystallized shells must be bivalves (clams) because of their relatively large size (up to 25 mm long). But we didn’t see the typical bivalve muscle scars or hinging teeth and sockets. They had to be ostracods — but so big? The typical ostracod valve, shown below, is two mm or less in length. These Silurian examples are over 10 times that size. It would be like me meeting my 60-foot equivalent. 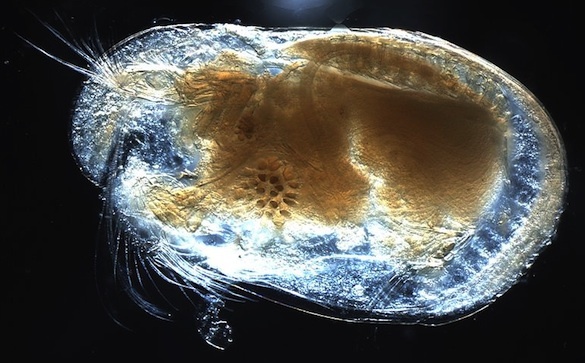 Turns out that Herrmannina is known for its gigantism in the ostracod world — and it is not even the largest. Cyamocytheridea sp. from the Eocene of Nederokkerzeel, Belgium. (Public Domain, Wikimedia.) This is the typical small size for an ostracod. Herrmannina is in the Order Leperditicopida of the Class Ostracoda. This genus was named in 1933 by Wilhelm Kegel (1890-1971), a geologist in the Preussische Geologische Landesanstalt of Berlin, Germany, who specialized in the Devonian and Carboniferous systems. I couldn’t find out much more about Dr. Kegel, but did stumble across an uncredited, undated low-resolution photo of him above. A fuzzy face from our paleontological past! Abushik, A. 2000. Silurian-earliest Devonian ostracode biostratigraphy of the Timan-Northern Ural Region. Proceedings of the Estonian Academy of Sciences, Geology 49: 112-125. Belak, R. 1977. Ontogeny of the Devonian Leperditiid ostracode Herrmannina alta. Journal of Paleontology 51: 943-952. Kegel, W. 1933. Zur Kenntnis palaozoischer Ostrakoden 3, Leperditiidae aus dem Mitteldevon des Rheinischen Schiefergebirges. Preussischen Geologischen Landesanstalt, Jahrbuch fur das Jahr 1932, Bd. 53, p. 907-935. Kesling, R.V. 1958. 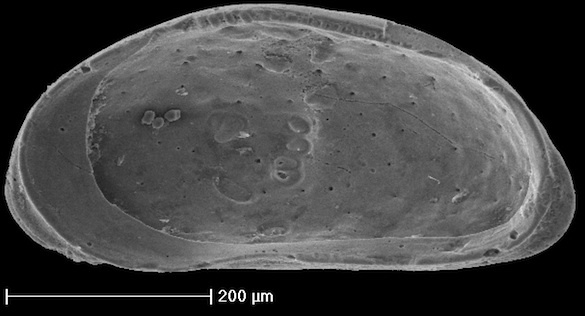 A new and unusual species of the ostracod genus Herrmannina from the Middle Silurian Hendricks Dolomite of Michigan. Contributions, Museum of Paleontology, The University of Michigan 14, No. 9: 143-148. Putzer, H. 1971. 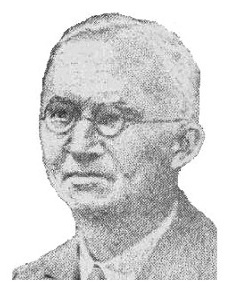 Wilhelm Kegel. Geologisches Jahrbuch 89: xiii-xxii. Vannier,J., Wang, S.Q., and Coen, M. 2001. Leperditicopid arthropods (Ordovician – Late Devonian): Functional morphology and ecological range. Journal of Paleontology 75: 75-95.